ALL-IN-ONE RESTRINGING TOOL - The ergonomic and high-quality design of the D'Addario Accessories Pro-Winder makes string changes quicker and easier than ever before with its built-in clippers, bridge pin puller and peg winder all rolled into one tool. MUST HAVE FOR EVERY CASE - Why fill up your case with three tools when you can have one that does it all? This indispensable tool has been designed to fit comfortably in your hand and for use on virtually all electric and acoustic guitars, basses, banjos and mandolins. Also available in a bass guitar version. 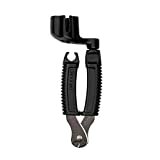 BUILT-IN STRING CUTTER - With the hardened steel clippers on the Pro-Winder string cutter you can cleanly cut through your old strings to remove them quicker and easier, and trim the excess off new strings after looping them through the tuning machines. INTEGRATED BRIDGE PIN PULLER- Designed with acoustic guitarists in mind, the Pro-Winder has a built-in bridge pin puller. This makes removing stubborn pins simple without risking damage caused by pliers and other tools. MADE IN THE USA - D'Addario Accessories is known for innovative, problem-solving, quality musical accessories that are proudly designed, engineered, and manufactured in the USA to the most stringent quality controls in the industry. Most ordinary peg winders serve the single basic purpose of winding the tuning pegs of a guitar during string changes, but the Planet Waves Pro-Winder isn't any ordinary peg winder. The ergonomic design of the Pro-Winder makes string changes easier than ever before with it's built-in clippers, bridge pin puller, and peg winder all rolled into one product. The peg winder is also designed to fit on virtually all guitars, banjos, and mandolins, truly making it a must have for every instrument case. The patented Pro-Winder design is also available for bass guitar. With a handle designed for efficient and comfortable use and a peg winder that fits both vintage and modern basses, the Bass Pro-Winder has you covered. The hardened steel clippers are also tough enough to cut through bass strings with ease. Designed to work for a wide variety of fretted instruments, the Pro-Winder for guitar is a perfect all-in-one tool for every player to keep in their gig bag or case. The Pro-Winder is the Swiss Army knife of string changing. The Bass Pro-Winder takes the user friendly and ergonomic elements of the original Pro-Winder and makes them applicable for both vintage and modern bass guitar tuning pegs. With the hardened steel clippers on the Pro-Winders string cutter you can cut through your old strings to make removing them quicker, and trim the excess off of new strings after looping them through the tuning machines. When it comes to bass guitar you are dealing with some pretty heavy gauge strings. The good news is that the hardened steel clippers of the Bass Pro-Winders string cutter are specifically designed to easily cut through the thickest of strings. Designed with acoustic guitarists in mind, the Pro-Winder also has a built in bridgepin puller. This makes removing stubborn pins simple without risking damage caused by pliers and other tools. The Bass Pro-Winder is designed to seat itself on a variety of peg winder sizes and shapes. The spinning head and comfortable handle make changing bass strings a much simpler and efficient process.